Location: The Emerald City I've been seeing so much wonderful metaphysical art lately that I felt obligated to post some of my own here. Perhaps it will help you with your own research and meditation! Feel free to post your thoughts here. The Pelican is often shown in alchemical texts stabbing its breast with its beak and nourishing its young with its own blood. The alchemist must enter into a kind of sacrificial relationship with his inner being. He must nourish with his own soul forces, the developing spiritual embryo within. 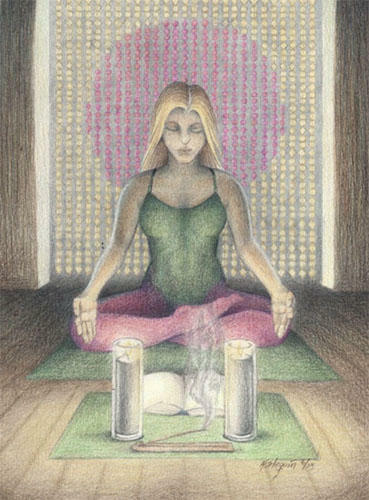 Anyone who has made true spiritual development will know well this experience. One's image of one's self must be changed, transformed, sacrificed to the developing spiritual self. This is almost invariably a deeply painful experience, which tests one's inner resources. 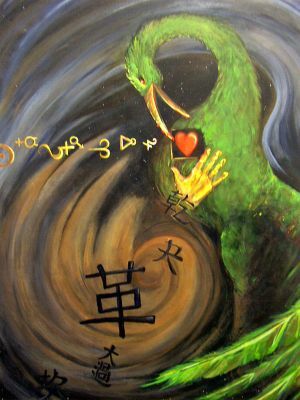 Out of this will eventually emerge the spiritual self, transformed through the Pelican experience. Location: The Emerald City "Calcination"
Calcination is the first stage of alchemical transformation. It is the process of smelting spiritual dross, of purification by fire. Location: The Emerald City "Conjunction"
Conjunction is the sum process of the seven steps in alchemical translation. 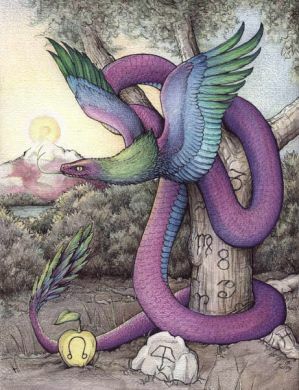 Quetzalcoatl, the god of knowledge, is coiled around the Tree of Knowledge (inscribed with the symbols of the seven steps of alchemical transformation) and guarding the forbidden fruit (the golden apple) in the Garden of Eden. The Philosopher's Stone enables us to transform the primordial lead of ourselves into the alchemical gold of enlightenment. Thank you for sharing your artwork with us and the information about each one. Sadly I do not have any art to share but I do enjoy photography. Location: California Beautiful and inspiring! Location: Bellingham This is beautiful! I'm glad that someone is still creating artwork such as this. There is a long tradition in this sort of emblematic work and the imagery is always fascinating. I would like to see more modern work like this. Location: Kaduna Nigeria 8 = ?! @ = ?! Location: The Emerald City The first is an infinity symbol turned on its side if you like, or maybe a circle on top of another circle. The second, if I'm right in guessing you're referring to the sun in the background, is a symbol of two concentric rings. A few of my viewers compare it to a fertilized egg. Those familiar with the symbology of alchemy can use these hints to draw their own unique experience from this picture. Beautiful art work - symbols.